This lunar soil marks the last time humans visited another world. It was here in December 1972 that the final Apollo astronauts walked on the Moon. This image is a solemn reminder of our space explorations past and (hopefully) future. This was taken last month by the Lunar Reconnaissance Orbiter, and it's the sharpest image ever taken of the Apollo 17 landing site. The LRO also snapped similarly high-res shots of the Apollo 12 and Apollo 14 landing sites. Apollo 17 was the last of the six successful Apollo missions - and NASA would again like to stress that there definitely were no secret returns to the Moon or anything stupid like that - and it spent three days from December 11 to 13, 1972 in the Moon's Taurus-Littrow Valley. The high resolution image data was taken during a period when LRO's orbit was modified to create a close approach of about 22 kilometers as it passed over some of the Apollo landing sites. That altitude corresponds to only about twice the height of a commercial airline flight over planet Earth. 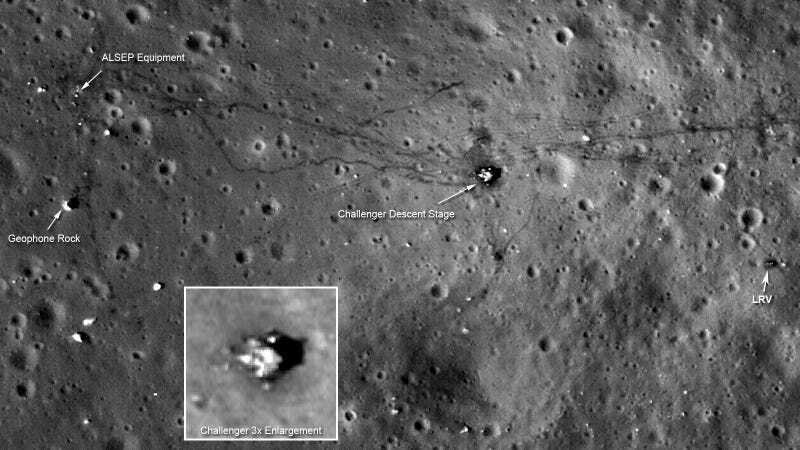 Labeled in this image are Apollo 17 lunar lander Challenger's descent stage (inset), the lunar rover (LRV) at its final parking spot, and the Apollo Lunar Surface Experiments Package (ALSEP) left to monitor the Moon's environment and interior. Clear, dual lunar rover tracks and the foot trails left by astronauts Eugene Cernan and Harrison Schmitt, the last to walk on the lunar surface, are also easily visible at the Apollo 17 site. You can click on the image for a much higher resolution look at the landing site.